This combined print and digital title has been re-written to provide 100% coverage of the new Study Design for 2018-2022. 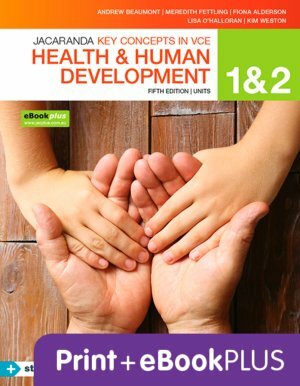 Our authors, including teacher and VCAA assessor Andrew Beaumont, have taken the opportunity to update the copy (including any relevant statistics or guidelines that have changed since the previous edition) and imagery, for a fresh take on a best-selling series. The textbook comes with a complimentary activation code for eBookPLUS, which provides students with opportunities to extend their knowledge and skills by engaging with videos, interactivities and links to relevant content on the internet. In addition, Jacaranda's unique exam preparation tool, studyON, is now included and fully integrated across the entire series. Featuring 10+ years of VCAA exam questions, studyON maximises every student's opportunity for exam success.